Occupying a prominent place in the front parlor of the Historic Shepherdstown Museum is a new piece that has several connections to the town. It’s a Jacob Craft tall clock, donated by Curt Mason, a former member of the Museum’s Board of Directors. 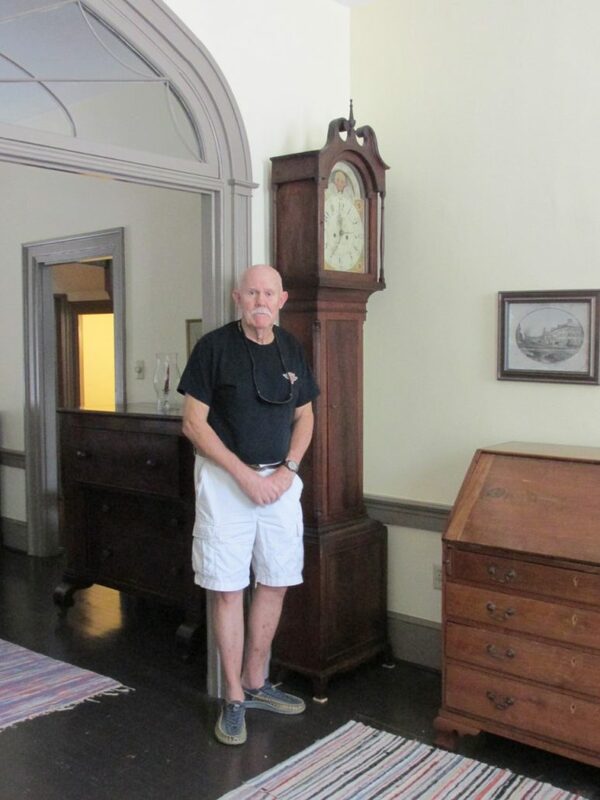 Not only was the clock made in Shepherdstown, but it belonged to a once famous member of the Shepherd Family. And the tale of the clock’s travels across the country and how it came back home again is worth telling. Jacob Craft was born in the Marburg region of Germany and died in Shepherdstown in 1825. He and his wife, Catherine, had three daughters and six sons, none of which took up their father’s trade. The Craft Family lived in a house on German Street, just below Princess Street. It’s been estimated that there are some 30 Craft clocks in existence. The Museum now has three. More information on Craft clocks and Jacob Craft is available on the Museum’s website here and here. The clock once belonged to Rezin Davis Shepherd, a Shakespearean actor in the first half of the 20th Century. A great-grandson of the founder of Shepherdstown, R.D., as he was known, was born in New Orleans in 1859 and grew up at Wild Goose Farm, just outside of Shepherdstown. From an early age, R.D. was interested in the theater. Taking the stage name of R.D. McLean, he appeared on the stage in various Shakespearean roles and in several early movies. R.D. and his wife, the actress Odette Tyler, lived for several years at the family farm in Shepherdstown, but sold the farm in 1911, to move to Washington, DC, and eventually to Los Angeles in 1919. A lengthier biography of R. D. Shepherd is in the Digital Exhibits section. R.D. Shepherd died in Los Angeles in 1946 and left his home and all its furnishings to his housekeeper, Viola Kidwell, who had served the family since its Shepherdstown days. Viola’s daughter, Elizabeth Shepherd Saxe was a close friend of Curt Mason’s mother. According to Curt, “Elizabeth apparently had valued Mom’s appreciation of the clock and felt that it would be in good hands if it were passed on to her.” For many years the clock graced the entrance hall of the Mason home, the oldest house in Pasadena, CA. In 1989, Mrs. Mason gave the clock to her son, who was living in Virginia at the time. She knew he clock had been made somewhere in Virginia and thought it only appropriate for it to reside closer to where it was made. 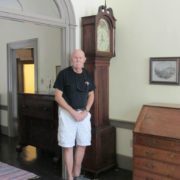 Curt eventually moved to West Virginia where the clock once again graced the entrance hall of an old farmhouse. But it wasn’t until several years later that he realized that the clock was made by an important artisan in a town just a few miles away. Curt and his wife Suzette Kimball, who are leaving the area, donated the Craft-Shepherd clock to the Museum in memory of Curt’s mother, Berthe Courtois Mason, who would have been happy to know it came home to within a block of where Jacob Craft brought it to life.